This page: An Introductory Note. 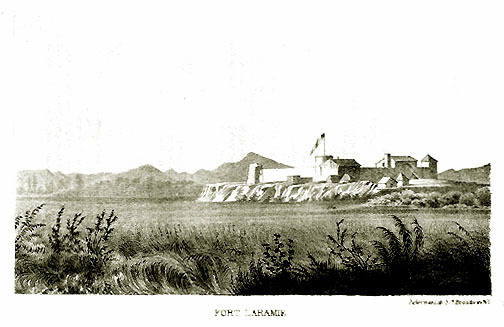 Ft. Laramie ("Ft. William"), 1837, from a sketch by Alfred Jacob Miller. Miller, a professional artist trained at the Ecole des Beaux Arts in Paris, but originally from Baltimore, accompanied the Scottish adventurer Captain Sir William Drummond Stewart on his trip to the 1837 Rendevous discussed on later pages. History is very often like looking at a desert. It is easy to focus on the prickly pear upon which one has just stepped or the individual stones and fail to observe the grand panorama, the snow capped mountains on the horizon or the thousand stars in the sky with the Big Dipper endlessly circling the guide star. Before focusing on the individual components of the State's history, it is appropriate to look at the grand epic of Wyoming. Some eleven thousand years ago man first appeared upon the scene. Few changes, however, occurred in the land which would later be named after an obscure valley in Pennsylvania. Beginning in the Seventeenth Century a series of wars broke out for dominance of the New World. Spain, Britain, and France each vied with the other for control of North America. What is now Wyoming was claimed by the respective kings of Spain, England, and France. Beginning in the early 19th Century, French-speaking trappers from Louisiana and Missouri ventured along the North Platte and the Yellowstone Rivers. Spanish trappers moved northward from Taos. 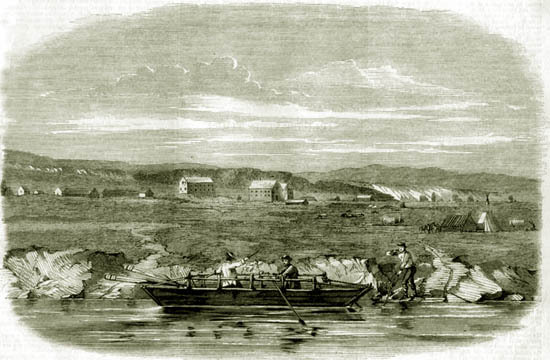 Canadian trappers from the Hudson's Bay Company moved eastward from British Columbia. All sought beaver desired by the hatters of Europe. Large trading companies vied with each other for dominance of the fur trade, The American Fur Company owned by John Jacob Astor, the British-owned Hudson's Bay Company, and the Rocky Mountain Fur Company. 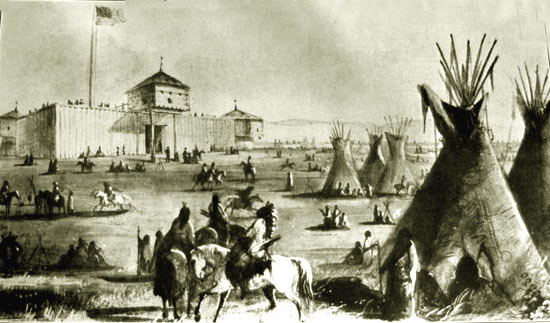 Trading posts were established along the trading routes, Fort Bent, Fort Lupton, and at Laramie's Point on the Platte, Fort William. But styles changed. The French king appeared in a silk hat and lower-priced furs were available from Argentina. Thus, the fur-trading era ended just as there began a tide of emigration passing the fort on trails to Oregon and California. An obscure farmer's son from Strafford, Vermont discovered tablets revealing a third Testment. This also led to a sweep of emigrants marching to Zion. Yet, Wyoming remained but a path to some other destination. 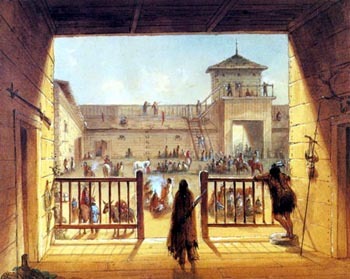 The fort changed from a fur trading establishment to one serving the emigrants and then was sold to the military to protect the line of communications to California. 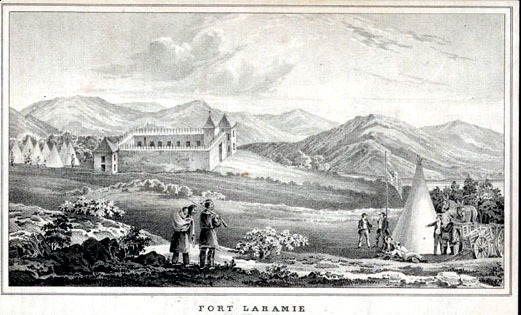 Fort Laramie, 1850. Engraving from Stanbury Expedition. In 1849-50, Captain Howard Stanbury conducted an expedition to Utah and the Salt Lake. Bridger acted as a guide. The Expedition discovered a "new" route into Utah. Captain Stanbury's report was published in 1853. The pony express came. Eighteen hundred miles away Fort Sumter was fired upon. In a sense, those shots were the defining moment in the formation of Wyoming. For out of the ashes of that war, the great cattle, railroad, and mining industries of the state arose. With the war in the east, the professional soldiers assigned to the fort were withdrawn to be replaced by volunteers. The Indians arose cutting the roads to California and the gold fields of Montana. With the end of the war, construction of the great railroad bypassed the fort yet brought permanent settlers to newly established cities, Cheyenne, Laramie, Rawlins, and Evanston, the latter named after an engineer remembered in the names of a street in Cheyenne, the great pass through which the railroad passed, and his namesake city, but forgotten in the history books. To protect the railroad, other forts were established named after heroes of the war, D. A. Russell, Fred Steele, Frederick Rawlins. 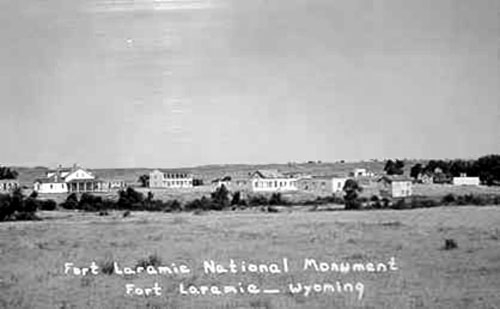 But the fort at Laramie's Point remained. To supply the great railroad, coal mines were established and timbering operations commenced. To provide manpower for the mines, immigrants from England, Finland, the fading Austro-Hungarian Empire and China settled in the areas of the coal mines. Fort Laramie, 1870, photo by William Henry Jackson. William Henry Jackson (1843-1942), as discussed more extensively with regard to the Hayden Expeditions, received his early photographic training in Vermont and came west in 1866 to work as a bullwhacker. He resumed his photographic career in Omaha and extensively photographed Wyoming and the Rocky Mountain West from 1869 though the early 20th Century. And with the end of the Civil War, from Texas began the great cattle drives. The Texas Trail passed by the Fort. A military expedition led by an impetuous young former general discovered gold in the sacred hills of the Lakota. Through the fort passed wagon trains to supply the miners in the Black Hills. With the end of the Indian Wars, great ranches larger than some eastern states were formed. But there was always the weather and the era of the great ranches ended, but not without rancor and bloodshed. The era of smaller ranches and irrigation commenced. And in the hills, new discoveries of mineral wealth, copper, oil, and uranium, came and went. Railroads pushed into the interior of the territory and new towns Sheridan, Cody, Riverton, Casper, and Lusk were founded. From a melting pot of native Americans, trappers, Texas drovers, soldiers, miners from central Europe, sheepmen from the Pyrennies, all hardened by hard work and self-sufficiency, modern Wyoming came into being. And the story of Wyoming is the story of those people, the mountain men, soldiers, surveyors, engineers, cowboys, Indians, miners, scoundrels, and saints. Music this page: A guitar medley of 19th Century aires, courtesy of Horse Creek Cowboy. Ft. Laramie Photos continued on next page.